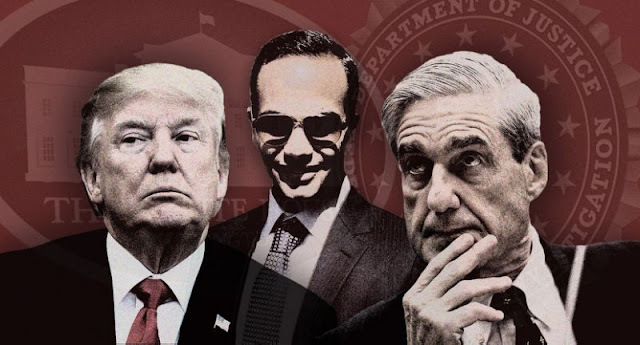 Donald Trump, George Papadopouolos and Robert Mueller. (Photo illustration: Yahoo News; photos: AP (4), Twitter. VietPress USA (Mar. 13, 2018): On March 8th, 2018, Yahoo announced that "The seeds of the relationships between Donald Trump and key figures in the Russian business and political worlds — now the subject of special counsel Robert Mueller’s investigation — were planted at least five months before Trump’s now famous 2013 trip to Moscow, during a previously unreported visit to a raunchy Las Vegas nightclub with the son of a prominent oligarch and Putin ally, according to a new book about Trump and his Russian ties. The book is excerpted today in Yahoo News and Mother Jones magazine. The book also reveals a January 2015 meeting at Trump Tower between Trump and two key figures in the Russia probe — the oligarch’s son, pop singer Emin Agalarov, and his publicist, Rob Goldstone — during which the real estate mogul strongly hinted about his plans to run for president. Both Emin Agalarov and Goldstone have come under scrutiny because of their pivotal roles in setting up the notorious June 2016 meeting at Trump Tower by promising Trump campaign officials “high-level and sensitive” information from the Kremlin that would “incriminate” Hillary Clinton. Some of the contacts and meetings among Trump, Russian billionaire Aras Agalarov, his son, Emin, and the British publicist Goldstone are detailed for the first time in the book, “Russian Roulette: The Inside Story of Putin’s War on America and the Election of Donald Trump,” by authors Michael Isikoff, the Chief Investigative Correspondent for Yahoo News; and David Corn, the Washington bureau chief for Mother Jones. The book will be released on Tuesday, March 13." (https://www.vietpressusa.us/2018/03/two-book-excerpts-from-series-of-12.html). Today the new book reports indicated more clear that George Papadopoulos, a former foreign policy adviser to the Trump campaign confessed that Trump personally encouraged him to arrange meeting with Russian President Vladimir Putin. George Papadopoulos, a former foreign policy adviser to the Trump campaign and potentially a key witness in special counsel Robert Mueller’s Russia probe, told federal investigators that before the election, Donald Trump personally encouraged him to pursue a summit with Russian President Vladimir Putin, according to a new book being published Tuesday. Papadopoulos’s account to Mueller — as reported in “Russian Roulette: The Inside Story of Putin’s War on America and the Election of Donald Trump,” by Yahoo News’ Michael Isikoff and Mother Jones’ David Corn — contradicts the public accounts of what took place at a critical meeting of Trump’s foreign policy team on March 31, 2016. It was at that meeting that Papadopoulos first informed Trump and the then candidate’s other foreign policy advisers that he had contacts in Britain who could arrange a summit between the GOP candidate and Putin. Although one of the campaign officials present, J.D. Gordon, has said the idea was shot down by then Alabama Sen. Jeff Sessions, Papadopoulos told Mueller’s investigators that Trump encouraged him, saying he found the idea “interesting,” according to the book, which cites sources familiar with his questioning by Mueller’s investigators. Trump looked at Sessions, as if he expected him to follow up with Papadopoulos, and Sessions nodded in response, the authors write. Sessions has said he has “no clear recollection” of the exchange with Papadopoulos. A White House official said that others at the meeting remember it differently than Papadopoulos. Last fall, Papadopoulos pleaded guilty to lying to the FBI about his contacts with Russians and became a cooperating witness in Mueller’s probe. The story of what happened at the only known meeting between Trump and Papadopoulos is one of a number of new details revealed in “Russian Roulette” about contacts that Trump, his campaign advisers and others had with various Russian figures and their associates during the 2016 campaign. The book chronicles the efforts of Alexander Torshin, a deputy governor of Russia’s central bank and a close Putin ally, and his assistant, Maria Butina, to curry favor with the Trump campaign — including their own attempt to set up a Trump-Putin meeting in Moscow. Those efforts began as early as July 2015, when Butina showed up at FreedomFest, a conservative gathering, in Las Vegas, where Trump was speaking. During a Q&A session, Trump called on Butina, who asked him about his stance on Russia and the sanctions imposed by the Obama administration on the country — eliciting the first response from the new GOP candidate on an issue that was a top priority of Putin’s government. Later in the campaign, the book reports that two top Trump officials — Steve Bannon and Reince Preibus — discussed a video of the Las Vegas event and wondered how Butina gained such quick access to Trump’s ear. In the spring of 2016, Torshin and Butina — who had close ties to the National Rifle Association — made a direct play to gain influence with the Trump campaign, floating their own proposal for a Trump-Putin summit during an international conference in Moscow on the plight of persecuted Christians, organized by Franklin Graham. In an email to Trump campaign officials, Rick Clay, a conservative activist, described Torshin as a “very close friend of President Putin” and encouraged the Trump team to strongly consider the offer. The U.S. government had a secret source inside the Kremlin who warned as early as 2014 that Russia was mounting an ambitious campaign of cyberattacks and information warfare against Western European democracies and the United States. The reports from the source were “startling” because they spelled out the “magnitude” of the Kremlin’s “intention to do us harm,” according to a U.S. official familiar with the matter. The secret Kremlin source also provided stark insights into the contempt that Putin and his senior officials had for President Barack Obama and his administration — often expressed in racist terms. In Putin’s presence, Obama would be called a “monkey,” and it was not uncommon for the American president to be referred to by the N-word, the book reports. Robby Mook, Hillary Clinton’s campaign manager, was so concerned about Trump’s ties to Russia-friendly advisers that he contemplated an idea to catch the Trump campaign in the act of colluding with Moscow by mounting what he called a “honeypot” operation straight out of a spy novel. The idea was that the Clinton team would plant a phony story about Clinton in the Democratic National Committee’s computer system and wait to see if the Trump campaign or its allies made public use of it. If they did, it would prove the Trump campaign was receiving intelligence from the Russian hackers who had infiltrated the DNC’s servers. But after Mook floated the idea to Marc Elias, the Clinton campaign’s lawyer, they decided it was “harebrained” and could backfire. President Obama was incredulous when he was first briefed in early January 2017 about the contents of a dossier, prepared by former British spy Christopher Steele, alleging that the Kremlin had a videotape of Trump engaging in sordid sexual behavior with prostitutes in a Moscow hotel room. “Why am I hearing this?” he asked his national security adviser, Susan Rice. “Why is this happening?” Rice explained that the intelligence community had no idea if the claim was true but that Obama needed to be aware that the allegation was circulating. A few days later, when Vice President Joe Biden was briefed about intelligence reports on contacts between various players in the Trump orbit and the Kremlin, he had a visceral reaction. “If this is true, it’s treason,” Biden exclaimed. When then President-elect Trump was handed a two-page synopsis of the Steele dossier, at the end of a U.S. intelligence briefing about Russia, he too had a visceral reaction. “It’s a shakedown,” Trump said, after FBI Director James Comey left the room. Trump believed he was being blackmailed by Comey. The incident, the authors write, may well have planted the seeds for what was later described by one of the most disastrous decisions of Trump’s presidency to date: the firing of Comey, a move that led to the appointment of Mueller as special counsel.